I'm honestly not even sure why I picked this book up, but once I started I burned through it pretty quickly. 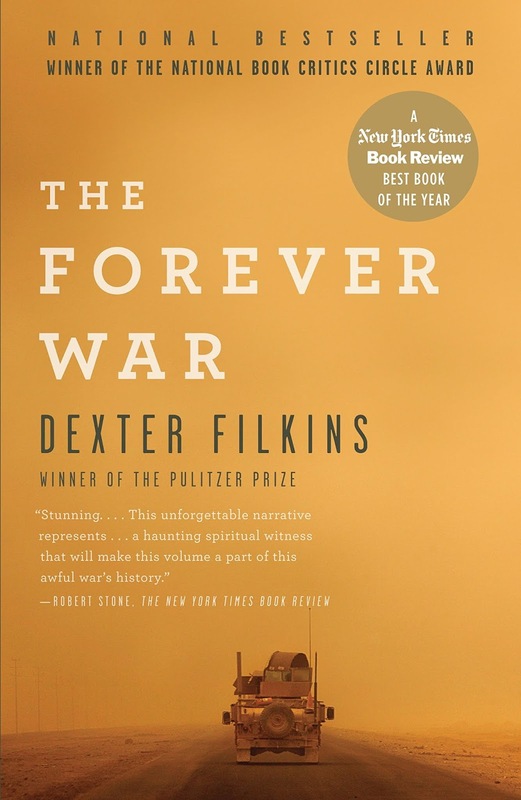 The Forever War, by Dexter Filkins, was published in 2009 and is largely a recounting of the time he spent on the ground in Iraq following the American invasion and throughout the insurgency that followed. I've read a number of books on Iraq, most recently the excellent The Fighters by C. J. Chivers but also The Gamble and Fiasco, both written by Thomas Ricks. I found The Forever War to be a very different kind of book. While The Fighters focused almost entirely on the collected stories of the individual soldiers, airmen, and marines that served, and while Ricks' books almost always themselves at a higher strategic level, The Forever War was told entirely through Filkin's own experience as a reporter living and working in Iraq during a period when the country was quite literally unraveling. The cover of The Forever War. Filkins does a tremendous job digging into both the absurdity and the tragedy of what he witnessed. One example that struck me was when the Americans renovated a decrepit park that had formerly been the site of a popular soccer field. The US soldiers, despite their best intentions, built a winding lover's lane throughout the park which rendered the soccer fields inoperable. As violence in the area increased, barbed wire was run across the park and a month after the soldiers withdrew, everything of value within the park itself, including the sprinkler heads, had been stolen. In the fall of 2003, Nathan Sassaman, then forty, was the most impressive American field commander in Iraq. He was witty, bright and relentless, the embodiment of the best that America could offer. He was the son of a Methodist minister and a graduate of West Point; as the quarterback for Army’s football team, he had led the school to its first bowl victory. When I met him, Sassaman was working day and night to make the American project in Iraq succeed, inspiring the eight hundred young men under his command to do the same. He slept in his boots. The breaking point for Sassaman had come two weeks before, on November 17. A group of his soldiers was on patrol, driving a pair of Bradley personnel carriers down the two-lane road near the entrance to Abu Hishma. A group of Iraqi kids started taunting the soldiers, running their fingers across their necks. The kids knew what was coming next. A couple of seconds later, a group of insurgents fired a volley of rocket-propelled grenades. One of them pierced the front of one of the Bradleys and sailed into the chest of Dale Panchot, a twenty-six-year-old staff sergeant from Northome, Minnesota. It nearly cut him in half. What struck me about the book were the ways in which Filkins was able to draw out time and again how culturally at odds that Iraqis were compared to the Americans who were supposedly liberating them, and just how utterly predictable the outcome of the entire effort was. I'd definitely recommend this book. Posted by Patrick Dugan on April 07, 2019 .